Actor Norman Reedus stars in the role of Daryl Dixon on AMC’s The Walking Dead zombie television series. He’s also known for his role of Murphy in BDS 1 & 2. Read below for an interview with Norman. Norman Reedus: I love being on The Walking Dead. It’s by far my favorite job I’ve ever been on. The cast is such a close group, we have such a fondness and respect for one another. It’s truly fun everyday. That goes equally for the crew. We love our crew. They help us everyday. The show is all of ours 100%. Michelle: Do you actually get to shoot the crossbow? If so, was using the crossbow hard to learn? Norman Reedus: Well, I don’t actually get to live fire the crossbow on a working set. Those shots are done dry firing with digital arrows put in during post. I have gotten to practice with it and I’ve become pretty creative with ways to utilize that thing. And it’s hard not to look cool holding a crossbow. I got pretty lucky with that one. Michelle: Is it easy playing the Daryl Dixon character? Norman Reedus: I don’t know if I would say it’s easy per say. He’s complicated. It’s easy to be hotheaded and blunt at times, but trying to find the little moments to show why or what’s made him this way is more interesting to me. The between the lines sometimes makes the actual lines more important I think. I do like that hillbilly though, he’s loveable in an unlovable way. Michelle: How do you feel about having an action figure made out in the image of your Daryl Dixon character? Norman Reedus: Have you seen them? They are so good. Those guys are artists. Really looks exactly like me. It’s almost creepy. They seriously did such a good job. I like it. My son has one now. Hopefully he will melt it and I catch him doing it. That would be funny. Michelle: Which job do you like that best; being an actor or being an artist? 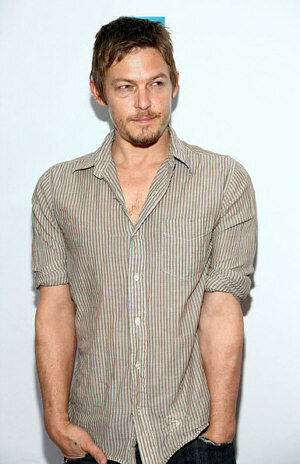 Norman Reedus: Well hmm. They are pretty similar I think sometimes. Sometimes not at all. I like em both. I used to sort of be embarrassed about being an actor. I guess I wasn’t confident enough then. Maybe I’m still not. I don’t know. I really am proud of being an actor now. It’s teaching me things about myself I don’t know that I would have learned or paid enough attention to before. For that, and the opportunities, I am forever grateful. I truly am. Michelle: Which character do you like playing the best? Daryl or Murphy? Norman Reedus: Hmmm that’s tough. I like them both for different reasons. Both are a blast. The first BDS was pretty much one of my first acting jobs and I was terrified and excited. But it was fun. Way too much fun. Daryl. I’ve been in this game a bit longer. I look at it all differently. I think maybe I’ve grown and am willing to try more things. For that reason Daryl. Michelle: Any words of wisdom for anyone that wants to be in the entertainment business? Norman Reedus: Oh man, I don’t know. Just be who you want to be. Make sure it’s what you want maybe. I don’t know. Everyone’s path is so individual isn’t it? It’s your 2 feet on the ground. Make good choices. Life’s all about choices sometimes, isn’t it? There are currently 3 Comments on Interview With Norman Reedus About His Hillbilly Daryl Dixon Character. Perhaps you would like to add one of your own? Great interview. I love Norman and I love this show, and I’m glad to see they’re developing Daryl a bit more this season.